The Ukraine crisis may benefit to the series of Export liquefied natural gas (LNG) terminal projects in the USA in beginning with Oregon LNG supported by Leucadia National Company (Leucadia) on the west coast of USA. Even though the Oregon LNG project is located on the Pacific Coast with business perspectives in Asia, the risk of gas shortage in Europe because of the Ukraine crisis may impact all regional markets. After the Sempra Cameron LNG project on the Gulf Coast in Louisiana and the Veresen Jordan Cove LNG project also on the west coast, Oregon LNG project stands in the next position for the US Federal Energy Regulatory Commission (FERC) approval. As Jordan Cove LNG, Oregon LNG project is rather unique as one of the only two export LNG terminal projects in USA being located on the west coast. Historically all these LNG projects were initiated as LNG import and regasification terminals, therefore they were concentrated on the Gulf Coast to download the LNG carriers from Middle-East and Africa. The other particularity of these two projects on the Pacific coast relies on exporting Canadian natural gas, mainly from British Columbia and Alberta. 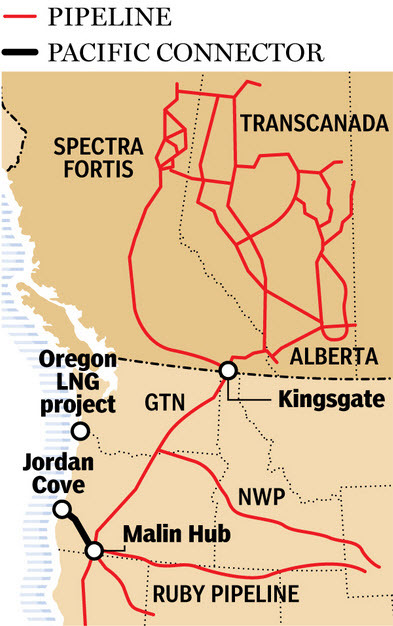 For these reasons the approval process for Jordan Cove LNG and Oregon LNG is even more complex as it requires the Canada National Energy Board (NEB) approval in addition to the US Department of Energy (DOE), the authorization for export to non-free trade agreement (non-FTA) countries, and the FERC. For the Oregon LNG project, Leucadia selected the Skipanon Peninsula in the Warrenton City of the Clatsop county in the north of the Oregon, close to the boarder with Washington state. Located on the estuary of the Columbia River in the Pacific Ocean, Warrenton provides Leucadia with the advantage to minimize the costs for the marine terminal and for the pipeline to supply the Oregon LNG trains in natural gas coming from Canada. The Oregon pipeline will be a major package of the Oregon LNG project with a 138 kilometers connection in Woodland, Washington, with the existing Williams Northwest Pipeline. The engineering company CH-IV International (CH-IV) completed the front end engineering and design (FEED) work and supported Leucadia in the submission of all the applications for regulatory approval. – 500 million cubic feet per day (cf/d) of natural gas import capacity. In this configuration the Oregon LNG project should require $5.8 billion capital expenditure for the Warrenton facilities plus $487 million for the Oregon pipeline project. Assuming that the export-import Oregon LNG Terminal project should be granted of all the necessary approvals in 2014, Leucadia may expect to load the first LNG carriers by 2018.